In order to specify how the web server allows an application to communicate with the database, we need to set up a database connection pool. A database connection pool is basically a group of reusable connections that a server maintains for a specific database. Web applications requesting a connection to a database obtain that connection from the pool. When an application closes a connection, the connection is returned to the pool. if the 'package' statement at the top needs to change..
You are now connected to MyNewDatabase in the IDE. Note that the new connection node icon appears whole when you are connected to a database. Likewise, it appears broken when there is no connection. At later stages, when working with databases through the Database explorer, you may need to manually connect to a database. You can do so by right-clicking the broken database connection node and choosing Connect. Now that you have the database server installed and configured, and have created a new database, you can register the MySQL server in NetBeans IDE. Begin by examining the functionality offered by the Database explorer located in the IDE's Runtime window (Ctrl+5). The Database explorer is represented by the Databases node (database node icon). From this interface you can connect to databases, view current connections, add database drivers, as well as create, browse or edit database structures. In order to allow NetBeans IDE to communicate with a database, you need to employ a Java-based driver. Generally speaking, drivers in NetBeans IDE use the JDBC (Java Database Connectivity) API to communicate with databases supporting SQL. The JDBC API is contained in the java.sql Java package. A driver therefore serves as an interface that converts JDBC calls directly or indirectly into a specific database protocol. 1. If you have just downloaded the driver, first extract it to a location on your computer. Set the root directory to: C:\mysql-connector-java-5.0.5. 2. In the IDE, in the Database explorer from the Runtime window (Ctrl+5) expand the Databases node and right-click the Drivers node. Choose New Driver. 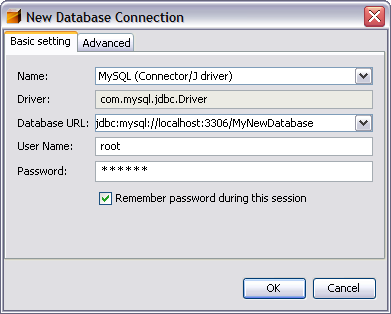 The New JDBC Driver dialog opens. Note: While you just made the database driver available to the IDE, you have not yet made it available to any specific application. At this stage, you can use the IDE to access and modify the database, but cannot do so from an application yet. Call up the list of all open tabs in the Editor by by pressing Ctrl-Tab while keeping the ctrl key pressed. Still with the ctrl key pressed, browse through the list of open tabs by hitting Ctrl-Tab; browse backwards through the list with Shift-Ctrl-Tab. Releasing the keys switches to the selected tab. Pressing Ctrl-Tab once and then letting both keys go immediately, will switch directly back to the previous tab used. Note however, that in some operating systems, Ctrl-Tab is already associated with another conflicting action. In this case, use Ctrl-~ instead.